GRP94 antibody LS-C15349 is an unconjugated rat monoclonal antibody to GRP94 (HSP90B1 / GP96) from human, mouse, rat and other species. Validated for IHC, IP and WB. Purified Grp94 isolated from chicken oviducts. Detects a ~98kD protein, corresponding to the apparent molecular mass of Grp94 on SDS-PAGE immunoblots. Species cross-reactivity: human, monkey, mouse, rat, rabbit, hamster, guinea pig, canine, bovine, sheep, porcine, chicken and Xenopus. 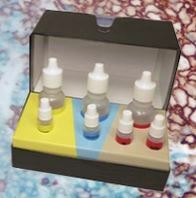 Suitable for use in Western Blot, Immunoprecipitation, Immunohistochemistry and Immunoelectron Microscopy. Western Blot: 0.5 ug/ml. Immunohistochemistry:: 1:30. Immunoelectron Microscopy: 1:20. Positive control: HeLa Cell Lysate.